Labotek has implemented a new and more efficient transport system for Danfoss plastic factory in Silkeborg. Three new outdoor silos have been erected in less than 24 hours and will function as an external warehouse for the plastic factory’s raw materials. The Danish manufacturer – Danfoss is establishing a “Campus” of Danfoss companies and administration in Silkeborg, which aims to bring together activities and competencies centrally located in Jutland. Danfoss is in the process of expanding its activities in Silkeborg, where more Danfoss companies are locating to. The Danfoss plastic facility, which manufactures all the plastic parts for the well-known Danfoss radiator thermostat, has been located in Silkeborg from the beginning, but as a result of the larger reorganisation in the factory area. Has led to the plastics production area moving from one end of the large hall to the other. To create the possibility of carrying out an installation of a material conveying system to feeding 29 injection moulding machines. Labotek, who have many years of experience in the management and programming of conveying systems for plastic granules, provided the turnkey contract for the new conveying system. One great advantage for Danfoss, was Labotek’s experienced team of installation engineers, who installed and commissioned the new automated conveying system. ”We have collaborated with Danfoss for a number of years, and we were therefore pleased to have the project of designing and installing the new conveying system, which is a 70 meter long piped vacuum driven conveying system installed between the silos and the plastic production”, says Zoran Hristovski, key account manager, Labotek. Each silo is 12 metres high and contains approx. 40 tons of raw material. In two of the silos, raw materials are stored for dry treatment, where the raw materials are dried before being transported to production. The raw material in the third silo did not require any drying, and is transported directly into the factory to a day silo which functions as a buffer tank. ”Since we still had to move our injection molding machines and piping system, it was obvious to activate the production flow in the factory at the same time. Together with the connection of the three new silos that will function as our external stock of raw materials”, explains Tonny Andresen, Value Stream Manager, Danfoss plastic factory in Silkeborg. In addition to the new silos giving the plastic factory more capacity, they also replace 28 smaller silos that have taken up unnecessary space inside the factory. The three silos were fitted with walkways and filters on the top of each silo to ensure that there was not any dust escaping into the environment. ”Now 30 vacuum lines are connected to the supply manifold located in the raw material store, which automates the distribution of plastic to the 29 molding machines we have at the factory”. 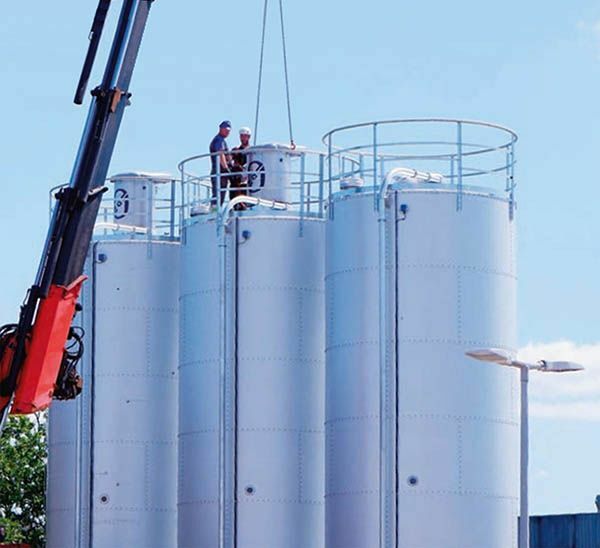 The silos were built and installed by Mafa in Ängelholm, Sweden, which is a supplier of complete silo systems. It was a demanding transport and logistical task, to deliver and erected the rigid silos within short time. ”The three silos have just been transported from Ängelholm to Silkeborg with special transport. The transport took place over night, and from early morning five men have been busy preparing and mounting the silos, which are erected using a crane. Thus, both the transport and the erection of the three giant silos have been carried out within the same day”, emphasizes Zoran Hristovski. In case the plastic factory needs additional raw material storage capacity, space has been made to establish a fourth silo in continuation of the three silos.